Heavy snow will continue to fall across the D.C. metro area Saturday morning, creating near whiteout conditions when combined with wind gusts of up to 30 mph. Snow could at a rate of up to 2 inches per hour through 10 a.m. Saturday. A trained spotter for the National Weather Service reported seeing 7 inches of snow in Washington, D.C. Friday night. By late Saturday morning, expect one foot to one and a half feet of snow in the metro area. Authorities are warning this could be a life-threatening storm, with 2 to 3 feet of snow possible before it's all over. Snow is expected to fall continuously for 36 hours straight. Road conditions were dangerous, and emergency officials in D.C., Virginia and Maryland warned drivers off the roads. Vehicles that tried the roads were slipping and sliding on the roads, with some getting stuck and others crashing. Though most people aren't behind the wheel, some drivers are still out in treacherous travel conditions. Shomari Stone reports. 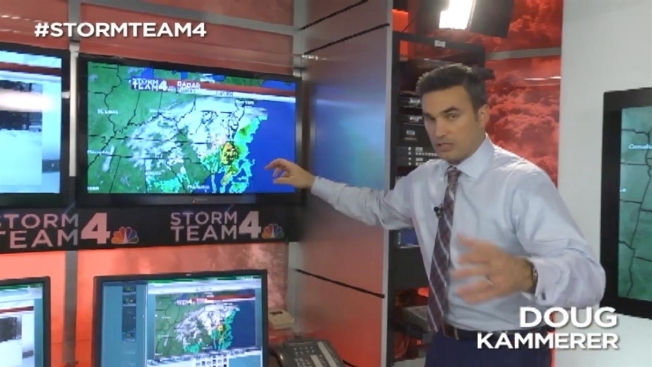 The storm began quietly, with the first flakes arriving around noon in Manassas and Gainesville, Virginia. By 7 p.m., some areas had already gotten upwards of 5 inches, and it's only going to pick up from there. Storm Team4 Meteorologists Doug Kammerer and Veronica Johnson with the winter storm forecast. 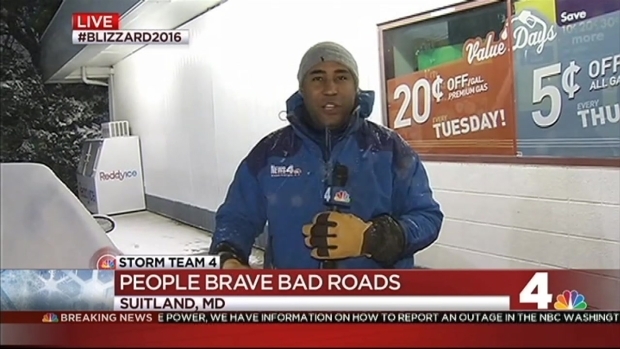 A blizzard warning for the D.C. area is in effect. Anne Arundel, Calvert and St. Mary's counties, where a high wind warning is in effect, could be slammed by gusts of 65 mph. 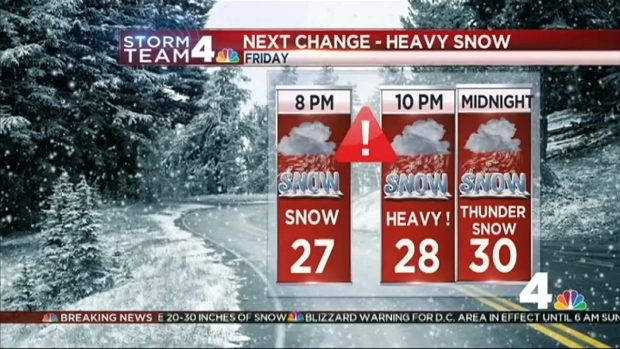 Storm Team4 said projected snowfall totals could make this the highest snowfall in D.C. history. Some parts of D.C., Maryland and Virginia could even get as much as 3 feet of snow, which would exceed the deadly 1922 Knickerbocker blizzard, during which 28 inches fell and the weight of the snow collapsed an Adams Morgan movie theater, killing 98 people inside. As the storm approached, officials strongly cautioned residents to be home by 3 p.m. and prepared with 72 hours of supplies -- and to stay indoors and off the roads. "This is a dangerous storm. There are way too many people on the roads now, and they need to get where they need to be," said Chris Geldart, director of D.C.'s Homeland Security and Emergency Management Agency, late Friday afternoon. Geldart said crews will plow continuously, and they treated "100 percent" of their roads before the storm began. However, he said, "we're now at the point where that pretreating is not going to be able to sustain with the amount of snow and the time lengths is coming in." "Far too many vehicles still out on the road with snow starting to fall heavily in many areas. Please take this warning seriously," the Maryland State Highway Administration posted to Twitter. The heavy snow and winds may tear down power lines, force road closures and topple trees. Officials warned D.C. residents who use Pepco that they could face outages that last for days. Residents around the region shared images of bare grocery store shelves and gas stations that have run out of fuel during a mad dash to prepare before the storm. The National Guard deployed 100 personnel in 30 Humvees to transport essential employees throughout the city. D.C.'s emergency command center went live at 6 am. Friday and will stay live through the aftermath of the storm, likely early next week. The blizzard warning won't expire for our area until Sunday at 6 a.m. However, even after the snow stops falling, it will likely take awhile for the region to dig out. Schools around the region were closed Friday. Government offices in the District and county offices in Montgomery County closed at noon. Metro announced that its entire system will close for the weekend, with Metrorail service ending at 11 p.m. Friday. Metrobus service shut down at 5 p.m. Friday, and MetroAccess service ended at 6 p.m.
One woman scrambled to beat the end of Metrobus service, afraid she wouldn't make it from Rockville to Wheaton. "I'm just hoping and praying I can make it," she said before ultimately catching the last Metrobus to Silver Spring. Woman's Body Found in Snow in Md. But another rider, Ben, wasn't so lucky. He works as a care provider at a Rockville nursing home. His shift will end after Metrorail ends at 11 p.m., which means he may have to spend the night at work -- and maybe more than one night. "Yeah, I'm prepared," he said. County bus services are also closed or are preparing to close. Arlington County's ART bus ended service at 1:30 p.m. Friday and will stay closed through the weekend. In Prince George's County, TheBus service has been suspended. 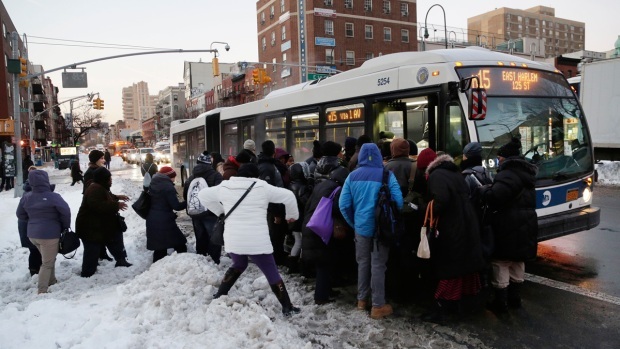 Montgomery County's Ride On bus service ended at 7 p.m. Friday and will stay closed through the weekend. 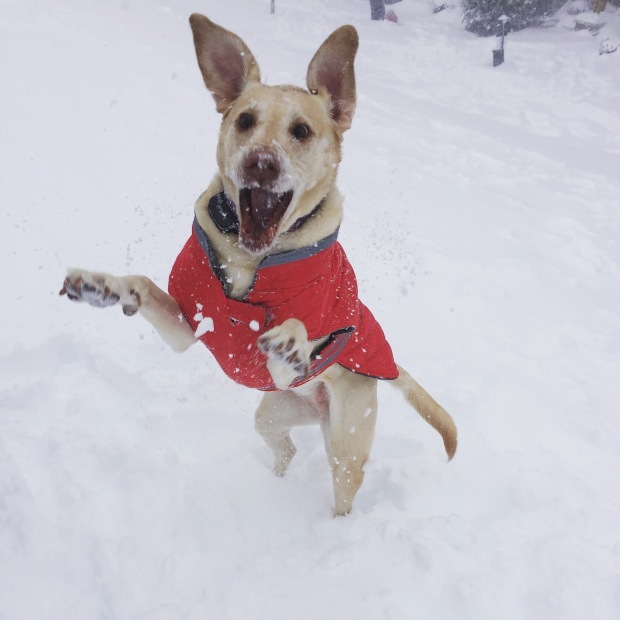 D.C., Maryland and Virginia leaders have all declared states of emergency, and a snow emergency is also in effect in the District. A snow emergency allows transportation workers to clear snow emergency routes curb to curb. Violators face a $250 ticket, a $100 tow and a $25-per-day fee until they pick up their vehicles. By Friday afternoon, the District had already issued more than 2,700 tickets and towed 187 vehicles. Virginia Gov. Terry McAuliffe declared a state of emergency for the commonwealth Thursday morning. The declaration authorizes state agencies to assist local governments in response to the storm. "All Virginians should take the threat of this storm seriously and take necessary precautions now," McAuliffe said Thursday. Maryland's state of emergency began at 7 a.m. Friday. The Maryland National Guard will be on standby, Gov. Larry Hogan said. A snow emergency for the entire state began at noon Friday. A "general emergency" has been declared for Montgomery County, where county facilities will be closed until midnight Sunday. Arlington County facilities also closed at noon and will remain closed Saturday. Chief Meteorologist Doug Kammerer said he's confident in the 20- to 30-inch forecast, but said he wouldn't be surprised if some spots got a whopping 3 feet. If we get 24 inches of snow, this storm would be the second-biggest snowstorm of all time, coming in only after 1922's devastating Knickerbocker Blizzard. If we get "just" 18 inches of snow, this storm would unseat the infamous February 2010 snowstorm from its 4th-place spot.